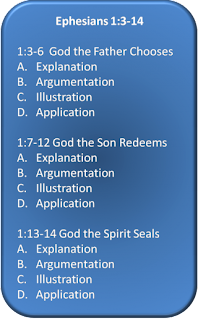 Kurt Michaelson: What is expositional preaching? Over the past few years, I have come to appreciate hearing the Word of God preached in an expository fashion. There is a great depth and richness that is brought forth by the pastor who has spent a considerable amount of time studying the text, so that preaching the sermon will help feed the hungry souls that look forward to hearing the sermon each week. Many of the popular televangelists of today are master chefs of these types of cookbook-type sermons. Spend some time listening to what they are really saying, see if it lines up with Scripture and I'm not just talking about acknowledging that they've used the correct book, chapter and verse either. It has to line up with Scripture and more importantly, be used in its context, otherwise, it is considered false teaching. And yet the souls of people who hear these televangelists each week are still left undernourished because of a lack of biblical, theological and doctrinal substance in their sermons. A common problem that many people who don't go to church and maybe even among some Christians too, they often complain about not being able to understand what the Bible says or even understanding what a passage of Scripture means. Well, my suggestion would be to first examine whether or not the sermon you are hearing each week is an exposition of Scripture, or a cookbook set of instructions. If this is the challenge you feel, or have felt, then to hear a passage of text from the Bible preached in an expository manner is the solution to overcoming this and maybe even finding a church that focuses primarily on preaching expository sermons. In this short video, several pastors from the 9 Marks ministry offer a brief explanation regarding expository preaching. Watch the video and then after, review the sermons you've listened to recently and consider whether they have been explained in its biblical context. Phil Morgan, senior pastor at First Assembly of God in Brookfield, CT wrote a brief post on his blog about expository preaching, titled, What Should Your Preacher Be Doing? Two Bible Pictures and it's a good, short read. I am fortunate to still be serving as a pastoral intern at First Assembly too, even though my internship experience has officially been over since June of last year. In Phil's post, there is a link to an audio file by John MacArthur, where he gives an explanation of what expository preaching means. Click here to go to the Grace to You site and listen to the audio. What I like most from the above video is Thabiti Anyabwile's statement at the end of this video, which is worth repeating and remembering the benefit of hearing expository preaching from a pastor. In Practical Wisdom for Pastors by Curtis Thomas, a book I read last summer, Curtis says the goal of the congregation, if the pastor has preached an expository sermon, is that "as they are leaving the sanctuary, they should be able to restate the main point of the message. In fact, we want them mulling it over and over in their minds." (p. 72). In today's world of sermons, is the main point of the sermon, from the text and is the congregation able to restate the main points since hearing the sermon last Sunday? Or is the main point generic and unrelated to the text and generic as well in recollection? The Apostle Paul instructed the church in Ephesus that God has given the gift and responsibility of teaching the Bible, to some, not all, but to some (Ephesians 4:11). By taking the time to exposit, or rather, explain verse 12 of Ephesians 4 in a sermon, the congregation can learn more in depth what it meant to be a teacher of the Scripture in the days of the Bible and what it means today. How is the church equipped by one who teaches/preaches? By providing instruction from the Word of God. What is the work of ministry for the teacher? To minister, preach the Word of God to people. How is teaching edifying to the body of Christ? It builds up believers in the knowledge and fear of the Lord. How does teaching unify the faith of believers? It deepens their knowledge of the Son of God, by growing into the measure and fulness of Christ in their lives. How does the Christian benefit learning from the teacher/pastor? By maturing in the faith and discerning sound doctrinal teaching from false teaching. 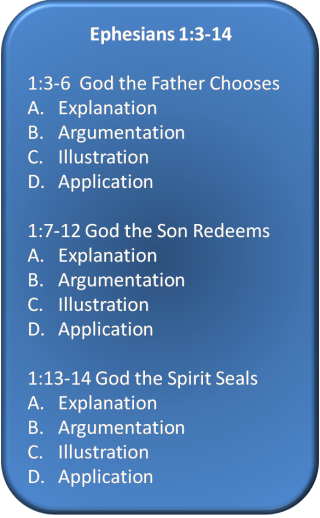 Each of the points above could be explained further, not from a philosophical perspective, but a theological one, which also includes an application for the congregation, coming from the text. In verses 15-16, there is further instruction regarding the benefit of this teaching, for the Christian believer too. In February of 2009, Pastor John MacArthur of Grace Community Church, preached two sermons regarding the consequences of not preaching expository sermons. The links to these two sermons are provided and well worth listening to more than once, even if you are not a pastor or Sunday School teacher. I love expository preaching and the benefits that it brings to the peacher, to the congregation and to the world. Each time I am given an opportunity to preach, this is exactly how I feel too. My responsibility either as a Sunday School teacher, or as one who preaches every week is to preach the Word and to do so in an expository manner. Would hearing a topical sermon achieve the same depth of theological understanding as an expository sermon? Why, or why not? Who are some of your favorite preachers that exposit the Bible? As always brilliantly done :) I love thought provoking discussions unfortunately I don't get to have many of those :). So for question 1: I sit in a church that does the encourage sermon every week. Every week he makes the sermon about us and not about God ,for some reason that became clear to me this past Sunday. I am truly undernourished and struggling because I am a student at heart and I love learning. Anyone who can teach me the Word intrigues and ignites me. For question 2 Shirley Maxwell a local preacher I know,Bob Sorge,Johnathan Kahn and others. "Many of the popular televangelists of today are master chefs of these types of cookbook-type sermons." “Because you have rejected knowledge, I also reject you as my priests; because you have ignored the law of your God, I also will ignore your children. We can read all about this love in John Chapter 14, but it comes down to one word and one action, LOVE. Let us teach that to all people by not our words but our actions, we can say one thing and do another, but our actions are from the heart, that will depict the living God, the messiah Jesus Christ to a lost, confused and deceived world. Stay strong, seek His word with out compromise, know He did this all for you alone because it is an intimate relationship, a personal one and may God bless you richly today as He has planed. Warren W. Weatherby said " For we not fight for victory, but from From Victory, for Jesus Christ conquered all things!"